Swedish director Jakop Ahlbom’s play named Horror thrilled and scared theatregoers this week as part of the London Mime Festival. It’s been described as ‘A homage to the horror film genre,’ and delivered exactly this in a tightly staged horror film-esque stage production. Surviving the haunted house trope along with many other pastiches, a young woman returns to her family home with friends. It doesn’t take much time before she starts to relive her oppressed childhood and the house awakens to her presence conjuring demons from her past. This is clearly a personal project for director Ahblom referencing much loved conventions from horror movies and at a similar wicked pace to what you would see on the screen. Just like a movie, the drama unfolds in front of you, there’s no dialogue, relying more upon mime acting accompanied by expressive movement to drive the drama forward. As the central character enters the Victorian-style house, picture frames begin to move up and down the wall and a closet in the living room glows mysteriously suggesting something ominous is inside. Then 1930s music sounds from a vintage stereo briefly scaring the trio. Their reactions are comical which is another theme carried throughout the play. After all Horror is a comedy-horror farce with equal moments of disturbia and humour. 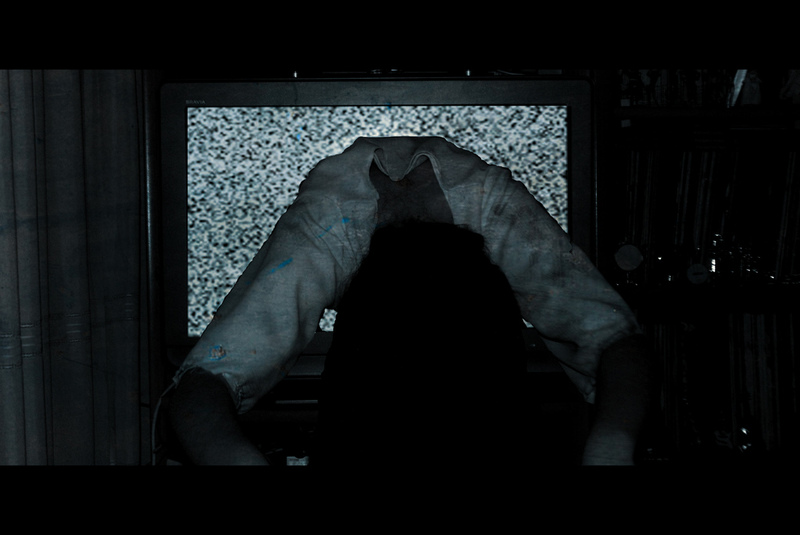 References to J-horror and The Ring are subtly placed within the narrative, such as when the television turns on by itself and there’s a creepy Sadako type character lurching towards the screen. Need I tell you what happens next? Flash photography is executed to precision, spirit entities creep across the stage and then vanish reappearing on the other side of the stage. Ahblom really knows how to put his actors to use with most of them playing multiple roles. There’s even a scene similar to the uncut version of The Exorcist where Regan crawls down the stairs as a spider. It just goes to how the careful and elegant depiction of an extremely terrifying scene gives way to sensational choreography. The blood work, although minimal, paid homage to Raimi’s Evil Dead II and perhaps even the 18th century Grand Guignol Parisian theatre scene where a whole host of gore trickery were performed. One particular trick, impressive although subtle was the flaming blood powder trick that gave an explosive spray effect on stage after one of the characters hands was chopped off by an axe. A mechanical hand then crawled across the stage and into the closet. The set itself was inventive and transformed into different locations with the use of clever lighting and props. A screen which formed a partition between the living room and kitchen, was also a projection screen where film footage were screened. In fact you wouldn’t even know it was a partition until the lights were on in the kitchen which also doubled up as a bathroom. A woody forest shielded by a clear Perspex barrier and a curtain also housed various scenes. Jakop Ahlbom’s Horror is amongst a small family of 21st Century horror on stage with Let the Right One In, Ghost Stories and even the up and coming The Ghost Train Doesn’t Stop Here Anymore a joint collaboration with Kim Newman, Christopher Fowler, Lynda E. Rucker and many more. Horror goes that extra step in an innovative production that parallels that of an edited movie. The Rosemary’s Baby score throughout was a good touch too! Read more about Jakop Ahlbom here.